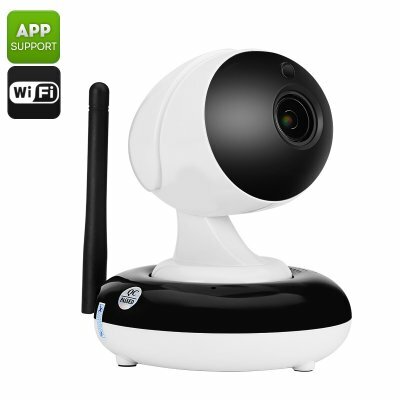 Successfully Added Wi-Fi IP Camera - 1/3 Inch CMOS Sensor, HD 720p, 3X Optical Zoom, Night Vision, Remote Viewing, Wi-Fi, Two Way Communication to your Shopping Cart. Always keep an eye on your property or loved ones -with this Wi-Fi IP camera you will never lose track of what’s happening inside your home or office. Keep an eye on your home while you’re away on holiday or simply use it as a baby monitor, the possibilities of this compact IP camera are endless. Whether you like to use it indoors or outside, thanks to its weather resistance this IP camera functions nearly everywhere. Its 90 degree viewing angle in combination with 355 degree horizontal and 90 degree vertical tilt control guarantees that not a single movement around this IP camera will stay undetected. Thanks to the camera’s powerful 1/3 Inch CMOS sensor and built in night vision up to 10 meter you will be able to record razor sharp 720p HD images at both day and night. When synchronized with the specially developed ‘’CamHi’’ mobile application you will be able to access your IP camera remotely. Instantly check the situation at your property by using your smartphone when ever you please, with this Wi-Fi IP camera you will constantly be up to date about the latest situation at your property. Additionally this IP camera is equipped with an intelligent motion detection feature that can be programmed to detect motion in four different areas at once. When motion is detected an alarm notification will be sent to your mobile phone or e-mail, ensuring you to be constantly up to date about the latest security status of your property. Featuring a built-in speaker and microphone this Wi-Fi IP camera supports two way audio communications, providing you with the perfect tool to keep an eye on your children who are sleeping in the other room or to stay in touch with elderly in need. Never miss a moment out of the lives of your loved ones – with this IP camera you can be ensured that they are save and well at any given moment. This Wi-Fi IP camera comes with a 12 months warranty, brought to you by the leader in electronic devices as well as wholesale IP cameras. Arabic: - وأي فأي الملكية الفكرية الكاميرا - Chinese Simplified: - 无线网络摄像机 - Czech: - Wi-Fi IP kamera - Dutch: - Wi-Fi IP-Camera - French: - Caméra IP Wi-Fi - German: - WLAN-IP-Kamera - Hebrew: - מצלמת IP אינטרנט אלחוטי - Hindi: - Wi-Fi आईपी कैमरा - Hungarian: - Wi-Fi-vel IP kamera - Italian: - Telecamera IP Wi-Fi - Japanese: - Wi-Fi の IP カメラ - Korean: - Fi IP 카메라 - Malay: - Wi-Fi IP kamera - Norwegian Bokmål: - Trådløst IP kamera - Romanian: - Wi-Fi IP Camera - Russian: - Wi-Fi IP-Камера - Spanish: - Wi-Fi Cámara IP - Thai: - กล้อง IP Wi Fi - Turkish: - Kablosuz IP kamera - Vietnamese: - Wi-Fi IP Camera.